Published: Sept. 18, 2015 at 11:16 a.m. Updated: Sept. 18, 2015 at 11:39 a.m.
Now that we've played a full week of football (plus an extra Thursday night game), we're starting to get a better idea of who's poised for a big season and who could end up disappointing. As such, we're checking our fantasy stock market to see whose stock is up and whose stock is down as we head toward the second Sunday of the season. 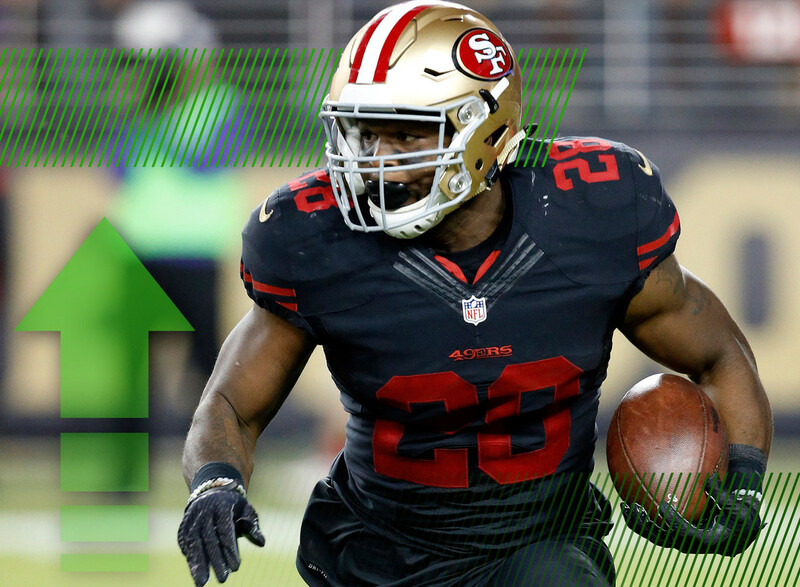 Even the most die-hard 49ers fans had to be surprised by Hyde's Week 1 performance. The second-year back led the world with 30.20 fantasy points in the season opener and reminded everyone that the Niners still lead with their power run game. The Hyde hype is returning to pre-training camp levels. This might be a slight overreaction to what happened on Monday night. Put simply, Bridgewater looked ... ungood. There are still plenty of reasons to be optimistic about the young quarterback, and for now we're willing to call this just one bad outing. But maybe we'll slow down with the adulation for the time being. Eifert had become a fantasy darling all throughout training camp and the preseason, but he turned the dial to 11 in the season opener. A.J. Green might still be the top option in Cincy's passing game, but Eifert is making a strong play to be Andy Dalton's second choice. Allen had been a prime bounce-back candidate in 2015 ... and did he ever bounce back in Week 1. The Cal product caught 15 of the 17 passes that came his way -- setting a single-game franchise record in the process. He won't have that kind of production every week, but it was nice to see Allen return to the form that made him a rookie sensation. We had been wondering all preseason who would be the odd man out in the Dallas backfield and it looks like it was the veteran who drew the short straw. With Joseph Randle leading the way and Lance Dunbar starring in the role of pass-catching back, McFadden was limited to seven total touches. It seems as though the pecking order has been set. It's disappointing to see Dez Bryant go down with an injury, but it opens the door for Terrance Williams to have more passes thrown his way. The speedy receiver was a large part of the Dallas passing attack after Bryant's injury and should have an increased role for the foreseeable future. Despite what we saw from Ameer Abdullah in the preseason, the Lions kept suggesting that Bell would continue to be their lead back. When Abdullah ripped off a 24-yard touchdown run the first time he ever touched the ball, there was no turning back. Bell will still get some work in the backfield, but it's clear that the rookie from Nebraska is Detroit's future. We're not sure what was worse news for Blue -- that he was part of a three-headed attack in the running game or that Arian Foster is closer to a return than originally anticipated. Either way, there's not much reason for fantasy fans to believe that the LSU product is going to offer much fantasy football value going forward. Moncrief flashed a few times last year, but he was forgotten in the hoopla surrounding the acquisition of Andre Johnson and the drafting of Phillip Dorsett. But it was Moncrief, not Johnson or Dorsett, who was second on the team in targets in Week 1 and appears poised to take over as the No. 2 receiver in the Colts offense. Moncrief could see even more work if Hilton is unavailable in Week 2. There were plenty of questions about who would be Atlanta's lead running back in the 2015 season. Those questions were answered when rookie rusher Tevin Coleman saw twice as many carries as Freeman. Just when it looked like Freeman was the heir apparent to the starting job, he now finds himself playing second fiddle to the new kid on the block.